Why are Indian farmers an angry lot today — stopping the supply of vegetables to cities and even spilling milk on roads? An answer to this can be found in the estimates of gross domestic product/ national income growth from the Central Statistics Office. The accompanying table shows two sets of growth figures. The first is the annual or year-on-year growth in the gross value added — GVA, which is basically GDP net of product taxes and subsidies — from agriculture for various quarters from 2012-13 to 2017-18, both in constant (2011-12) and at current prices. The second one looks at these growth rates in the GVA for the economy as a whole. The striking thing emerging from the data is how agricultural growth has collapsed in ‘nominal’ terms, i.e. at current prices unadjusted for inflation. For farmers, increase in output — which is what growth in ‘real’ terms or at constant prices measures — is important. But what ultimately matters more for them is income, which is a product of both output and current prices. And since GVA is the value of output less the cost of all inputs and raw materials that go into the production of any good, it is a reasonable proxy for income or ‘take home’ for the farmer. 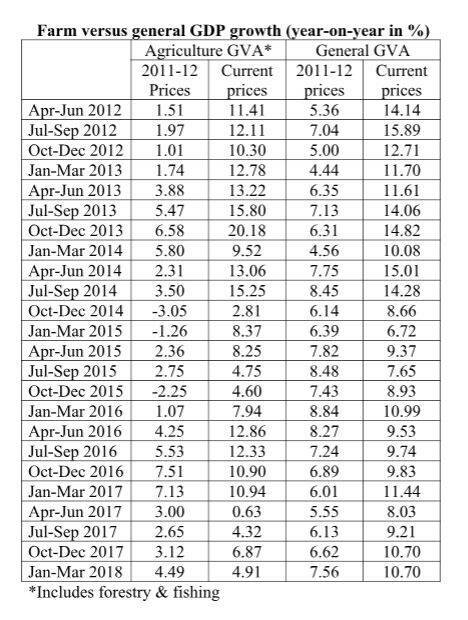 Viewed from that perspective, only six out of the 16 quarters of the Narendra Modi government from April-June 2014 have recorded double-digit nominal farm income growth, as against seven in the preceding eight quarters. Moreover, there has been a marked narrowing of the gap between nominal and real income growth. This is so especially since October-December 2016, which was the quarter when demonetisation happened. The most extreme case was April-June 2017: in that quarter, nominal agricultural growth, at 0.63%, was actually below even the increase of 3% in real terms. Simply put, while farm production rose 3% year-on-year, prices, however, fell by 2.37%, resulting in the value of output going up by just 0.63%. No wonder, this time of last year witnessed violent farm protests across many parts of the country — from Nashik-Ahmednagar in Maharashtra and the Neemuch-Mandsaur-Ratlam stretch in Madhya Pradesh to Rajasthan’s Hadoti region covering Jhalawar, Baran, Kota and Bundi districts. 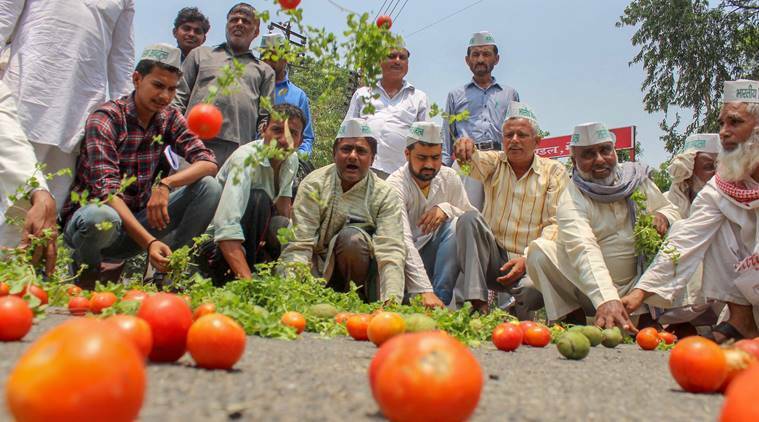 Farmers had harvested a bumper rabi crop then, only to see the prices of their crops crash. The traditionally cash-based produce trade in mandis is yet to recover from the shock of demonetisation. And nor have farm incomes; nominal GVA growth for the sector was a mere 4.9% in January-March 2018. Low single-digit income growth would not matter much, though, if this was the case with the rest of the economy as well. But the difference between growth in overall nominal GVA and that of agriculture has widened considerably in 2017-18 — unlike in earlier years, when the latter actually exceeded the former during many quarters, as can be seen from the table. It only points to the fact that farm prices today are rising at a lower rate than general prices. The worsening terms of trade — wherein farmers find the prices of their produce not rising as much as that of the goods and services purchased by them for intermediate and final consumption — is what’s really driving the current agrarian unrest. If nominal farm incomes continue to grow at 5% or below, it will take over 14 years for their doubling. A far cry from the target date of 2022 for doubling that Prime Minister Narendra Modi had himself first set at a farmers’ rally in Bareilly, Uttar Pradesh on February 28, 2016.